An international team of researchers has developed an eerily realistic robotic stingray that blurs the line between animal and machine. Fuelled by light-activated heart cells, the cyborg fish could inspire the development of futuristic medical devices and incredibly life-like synthetic animals. 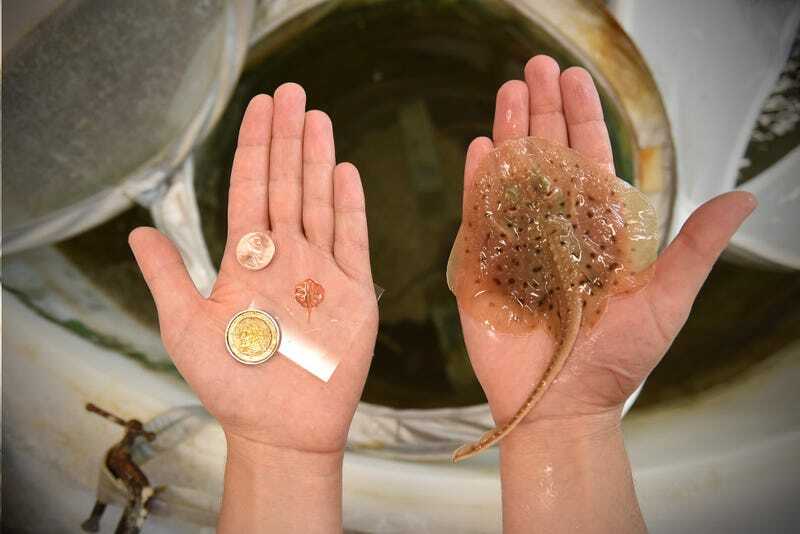 Like an actual stingray, this miniature robot features a flat body with long wing-like fins. And like the real thing, it swims by flapping its fins up and down. Its polymer “skin” is wrapped around a gold skeleton and laced with about 200,000 rat heart muscle cells called cardiomyocytes. At just 16 millimetres long and weighs just 10 grams, it is a cyborg in the truest sense—a hybrid of biological and synthetic components. The effort to build the robotic stingray was headed by Kit Parker, a professor of bioengineering and applied physics at Harvard University. His “eureka” moment for the project came while visiting the New England Aquarium with his daughter, Caroline. Parker took this idea to his team, and they began to build their miniature, soft tissue robot. After creating a neutrally charged gold skeleton, the researchers overlaid it with a thin layer of flexible polymer. A series of light-sensitive (photovoltaic) cardiomyocytes were strategically aligned along the top. When exposed to light, the muscle cells collectively caused the fins to contract in a downward motion. To create the upward motion, the researchers designed the gold skeleton such that it naturally stores some downward energy, which is later released when the cells relax. So that’s what they did. Leveraging the power of the light-sensitive cells, Parker’s team was able to steer the stingray using asymmetrical pulses of light. As the stingray moves forward, the pulses can guide it either to the left or right. Different frequencies of light can be used to control its speed. They tested the light-driven navigation system by having the cyborg stingray navigate through an obstacle course. There’s more to this project than just creating a life-like fish. Parker’s primary interest is in understanding the heart and how various parts of the anatomy can help with blood flow. “With the exception of crustaceans, almost all marine life forms have muscles designed to move fluid,” said Parker. “To advance our studies of the heart we have started looking at marine life forms and the muscular pumps they represent.” Parker hopes to gain better insight into the human heart and heart disease by reverse engineering other forms of muscular pumps found in nature. This research could also lead to even better, and more useful, automated and semi-automated robots. When it comes to building better robots, biology has its advantages. For instance, this particular bot is faster than other similar devices; its cells function as both actuator and sensor. “Living muscle cells are much more energy efficient than synthetic actuators and can be programmed to do cool things,” said Parker.